One of the raps against Golden Age mysteries is that being all about clever plotting and puzzle solving, they lack psychological depth and subtle characterization. I’ve been reading quite a bit in this area this year, largely due to the appearance of British Library Crime Classics on the publishing scene. In my view, there’s some truth to this allegation, yet some of my recent reading serves to dispute that assumption. In Before the Fact by Francis Iles, a woman named Lina Mclaidlaw enters into marriage with Johnnie Aysgarth, a feckless charmer who may turn out to be a murderer. Iles throws plenty of curves at the reader before the arrival of the novel’s climax. As with many basic plot devices, this one doesn’t seem at first to be startlingly original, yet in the hands of a skilled writer like Iles, it becomes very compelling. An Amazon reviewer commented that Iles’s description of Johnnie’s clever wooing of Lina “ startled me with its psychological accuracy.” I agree. Johnnie could always make her laugh. That, Lina knew, is the greatest bond of all between two people, to be ready to laugh at the same things. And they did laugh, enormously. Lina told Johnnie that he had laughed his way through their honeymoon from beginning to end; as indeed he did, and sometimes in the wrong places. “Francis Iles” was a pseudonym of Anthony Berkeley Cox, a major figure in the pantheon of Golden Age crime writers. Before the Fact served as a the basis for the 1941 Hitchcock film Suspicion. The novel is currently available as a $.3.99 Kindle download on Amazon. 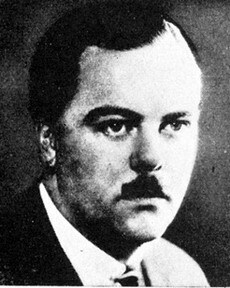 ‘Henry Wade’ was the name under which Henry Lancelot Aubrey-Fletcher wrote varied, thoughtful and entertaining crime fiction for thirty years. 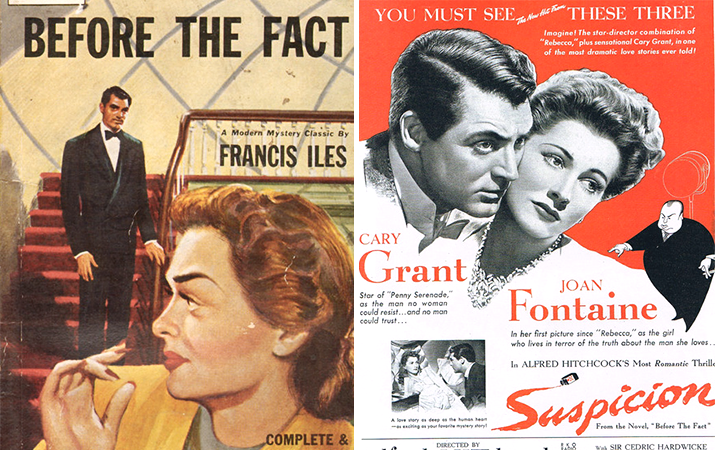 His career stretched from the 1920s to the late 1950s, when psychological suspense was coming to the fore. He played an important part in the development of the genre, especially but not only in the credible portrayal of the business of detection, and the ordinary people whose lives are changed by crime. I am really not sure why his gifts have long been under-estimated by commentators, who are apt to bracket him with the so-called ‘humdrum’ writers such as John Rhode. 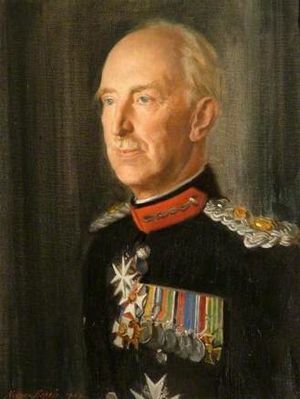 Aubrey-Fletcher had a distinguished military career during the First World War, and several of the Henry Wade novels reflect his understanding of the impact that conflict had on those who lived through it. The Dying Alderman (1930) is a capable whodunit with neat use of a ‘dying message’ clue, but Mist on the Saltings (1933) is even more effective; a study in character that was ahead of its time. The novel also benefited from an evocative setting on the East Anglian coast. Released for Death (1938) presents a sympathetic picture of a criminal exploited after leaving jail by a career villain. Such bitterness has the acrid tang of first hand experience. Like so many others, John Pansel emerges from this Hell on Earth wounded in both body and spirit. Eventually he and his wife Hilary take a cottage at Bryde-by-theSea, a small Norfolk village. John hopes to recover his strength, and to be able to make art again; Hilary aspires only to be his help-meet and smooth his way. Bryde-by-the-Sea, though nominally a harbour, lies nearly a mile back from the ocean which surges invisibly against the line of low sand dunes limiting the northern horizon. In between lies a wide expanse of weed-grown mud, intersected by a maze of channels which at high tide are full to the brim of salt water and at low are mere trenches of black and treacherous ooze. These then are the Saltings; the home of a hundred varieties of sea-birds, of countless sea plants, of insects, reptiles, fishes, animals–according to the state of the tides and the time of year; at one time a silvery dazzle of southernwood, at another green with samphire, at another brown with the sea-churned mud, and sometimes–at the highest of the ‘springs’–completely submerged under the smooth, swirling waters of the flowing tide. Dreary and desolate though they are, the Saltings have for those who love them a fascination which no written word can describe, a beauty which defies the most skilful brush. Nevertheless, John Pansel is committed to bringing them to life in his art. I found this to be a powerful novel, beautifully written. (My paperback copy is replete with Post-it flags.) According to Martin Edwards, Lonely Magdalen by this author is even better. I own it and hope to read it soon, although it clocks in at 350 pages of rather small print. Like Mist on the Saltings, it’s not currently in print, nor is it available as an e-book. I obtained used paperback copies from Amazon. 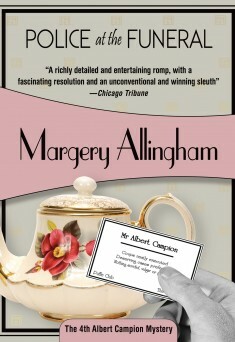 For reasons which I can’t quite pin down, I’ve not heretofore been a fan of Margery Allingham’s Albert Campion novels. Campion always struck me as a low rent Lord Peter Wimsey; that goes double for his “man,” Magersfontein Lugg (no comparison with the stately Bunter, I mean). But this year I read Police at the Funeral and loved it. It’s the story of a very strange family in a heap of trouble. Some the family members are actually rather appealing on a personal level; others, not so much. At any rate, Campion has a good friend whose fiancee lives in the home with these folks, and he comes to Albert entreating him to help. And Albert agrees to do so, getting himself involved clear up to his eyebrows and beyond. Somewhat to his host’s embarrassment Mr Campion shook hands with the dog, who seemed to appreciate the courtesy, for he followed them back to the hearth-rug, waiting for them to be seated before he took up his position on the rug again, where he sat during the rest of the proceedings with the same air of conscious breeding which characterized his master. Felony & Mayhem Press have done a great job of bringing the Campion books back into print. The last two titles I want to cite here are part of the much-praised British Library Crime Classics series of reissues. 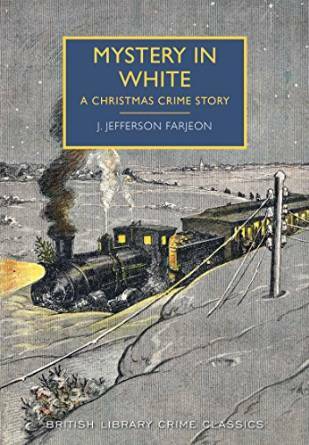 First, J Jefferson Farjeon’s Mystery in White: A Christmas Crime Story. A train gets stuck in a snowstorm, and a party of passengers decides to disembark and attempt to reach a railway station on foot. Mystery in White was a surprise hit in the UK last year. It’s a real treasure – and a great Christmas gift for the mystery lover on your list. A fair number of the British Library Crime Classics are short story anthologies. These give the reader a chance to sample the works of a number of distinguished writers of the crime fiction of the past. Thus far I’ve read two of these collections all the way through: Resorting To Murder and Capital Crimes. Skillfully curated and annotated by Martin Edwards, both were very enjoyable. The latter seemed somewhat meatier to me; it’s my next selection for discussion with the Usual Suspects when my turns comes around again (July 2016). 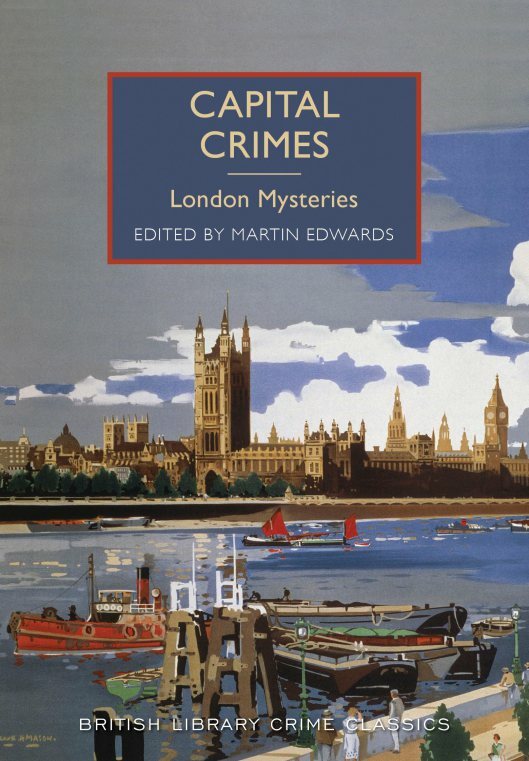 Most (not all) of the authors included in Capital Crimes were not known to me, or barely known: John Oxenham, Richard Marsh, Ernest Bramah, Edgar Wallace, Thomas Burke. 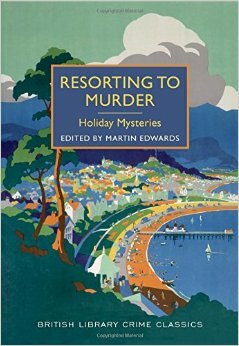 There are seventeen stories in all; Margery Allingham makes an appearance, as does the aforementioned Henry Wade. Just looking through the book again makes me realize I’m going to have to reread it in order to refresh my memory. Such a pleasing task. Well – pleasing in general, the exception being the first story in the collection. This is one of the most genuinely shocking tales I’ve come across in a long time; it’s at least as much a horror story as it is a crime story. For me, this was especially true, given the identity of the author. Hint: it is not a Sherlock Holmes tale. Hmm – actually it looks as if the British Library conference you mention will take place THIS June – 2016. You still have time to sign up and report back to us. No doubt it will be excellent! Well, Carol, I did not catch that – I only knew about the conference that occurred in June of this year. I did not realize that there was another one planned; the designation “2016” didn’t register, as I was so focused on the reading list. At any rate, this is excellent news! Click here to see last year’s program. Yes, the BL conference is back again next June, and I believe they’re open for registration, if you plan to attend. (I’m on the wrong side of the pond, alas, and probably won’t be able to get over for it). 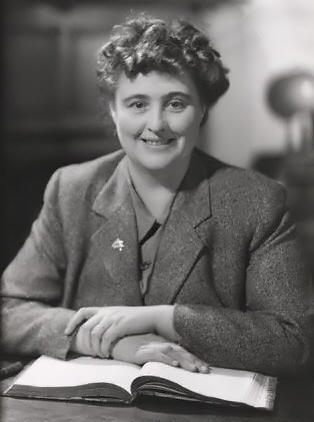 As for Margery Allingham, I strongly recommend Flowers for the Judge. 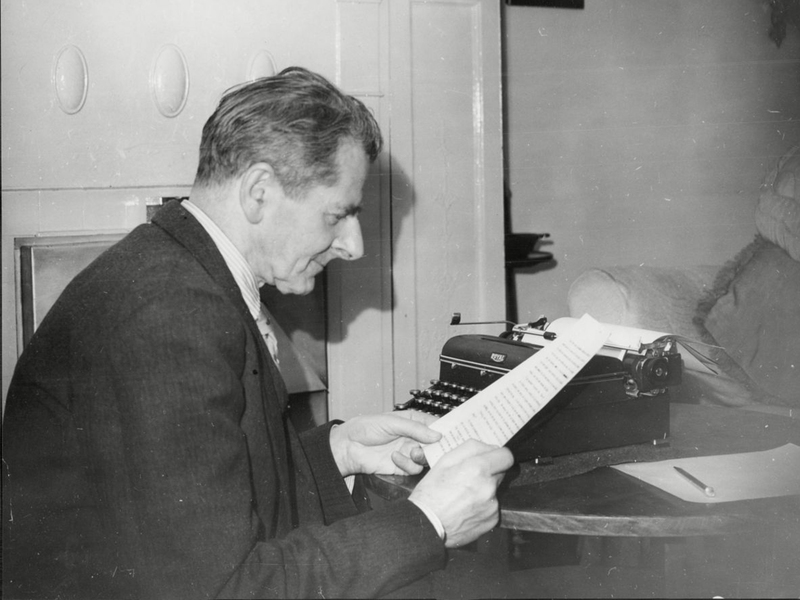 Allingham wrote all sorts of books for Campion – some thrillers, some mysteries, some hybrids. This one is definitely more of a traditional detective story/mystery and includes a very good locked room puzzle as part of it. It also has one of the best closing sequences – the last couple of sentences in particular – of any mystery I’ve read. I hope you can read it and enjoy it.